Born into a life of immense privilege and influence, Celine is as at home in the most glamorous cities in the world as in a pop-up trailer in the wilderness. She's an artist, and also a Glock-toting P.I. who uses her prodigious covert-ops skills and connections to defend the underdog, often works pro bono, and specializes in reuniting birth families. 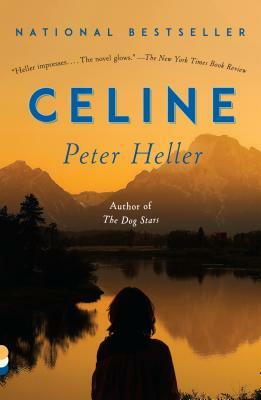 When Gabriela seeks out Celine to help uncover the truth about her father’s disappearance twenty years before (supposedly mauled by a bear), Celine can't resist. The trail leads past some heroic characters and acts of bravery on both personal and global scales. It's a thrilling chase. The heartbreak is that no heroics can prevent us from failing each other - even the ones we love the most - at some point. No act of love goes unpunished. And sometimes people just do terrible things. Plagued by her own scars, it's Celine's determination to keep living and loving and daring and facing down danger and darkness which is a true inspiration. She is a model of courage and grace. Celine is a sweet and powerful ode to love and life. Celine is not your typical private eye. With prep school pedigree and a pair of opera glasses for stakeouts, her methods are unconventional but extremely successful. Working out of her jewel box of an apartment nestled under the Brooklyn Bridge, Celine has made a career out of tracking down missing persons nobody else can find. But when a young woman named Gabriela employs her expertise, what was meant to be Celine's last case becomes a scavenger hunt through her own memories, the secrets there and the surprising redemptions. Gabriela's father was a National Geographic photographer who went missing in Wyoming twenty years ago and while he was assumed to have been mauled by a grizzly his body was never found. Celine and her partner set out to Yellowstone National Park to follow a trail gone cold but soon realize that somebody desperately wants to keep this case closed. Combining ingenious plotting with crystalline prose and sweeping natural panoramas, Peter Heller gives us his finest work to date. PETER HELLER is the best-selling author of The Painter and The Dog Stars. He holds an MFA from the Iowa Writers' Workshop in both fiction and poetry. An award-winning adventure writer and a longtime contributor to NPR, Heller is a contributing editor at Outside magazine, Men's Journal, and National Geographic Adventure, and a regular contributor to Bloomberg Businessweek. He is also the author of several nonfiction books, including Kook,The Whale Warriors, and Hell or High Water: Surviving Tibet's Tsangpo River. He lives in Denver, Colorado.